What makes a Rare game? Perhaps it is the ostensibly child-friendly, anthropomorphic creatures whose statues greet you as you drive through the studio’s substantial, wooded grounds. Slightly unhinged squirrels and birds stare toothily, convincing you that, if you stay after the sun sets, you will never leave this place alive. Perhaps it is the mischievous, sometimes scatalogical sense of humour that ties all the games together. Or maybe it is the use of colour that make Rare games like Viva Pinata an enduring joy. More Sea of Thieves clues were found in a recent datamine. Sea of Thieves has that: a lovely, vibrant, pastel-coloured art style gives its oceans a charm that rival Wind Waker. 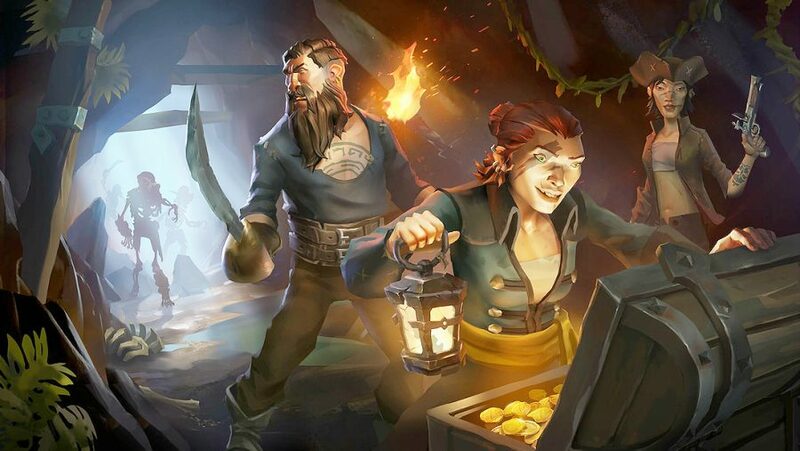 However, instead of anthropomorphic animals, Rare’s next game features a cast of misfit pirates armed with guns, concertinas, and flagons of grog. This might be a multiplayer game where you can headshot rival players, but it is, unmistakably, made by Rare. Only, this time, you create the humour. “At the very start of this project, we went around the team with a camera and asked, ‘What makes a Rare game to you?’,” executive producer Joe Neate tells me. “One of them was, ‘It’s something that encourages player creativity’. Another was, ‘It’s a reflection of the people who work at Rare’ – that one is probably my favourite. The aforementioned concertina is the perfect symbol of this ethos. During my hands-on time with Sea of Thieves, I use the instrument to blast out Ride of the Valkyries as we rush another ship full of game journalists during a storm. When we are all blown into the water, I use it to play a melancholy shanty as we swim for land, away from pursuing sharks. Once on the island, one of my crew pulls out their hurdy-gurdy and layers over the top of my melody as another member of our crew drinks grog, stumbles about, then throws up the contents of their stomach on our shoes. Sea of Thieves embraces nautical cliche. It is a pirate game from a landlocked UK studio – Rare’s vision of piracy acquired via popular media – and it is wonderfully ridiculous as a result. 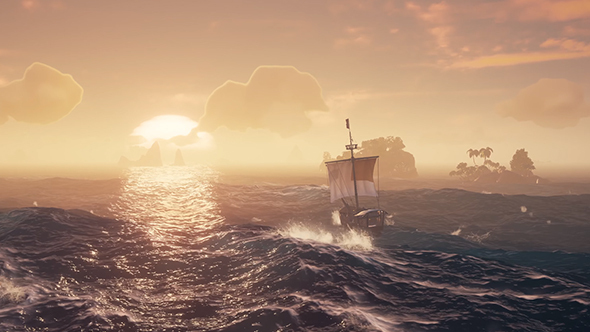 If you are in the open water and there is nothing around, Sea of Thieves gives you the tools to make your own fun, and much like the game’s designers, to express yourself through the game. Pop your friend into one of the ship’s cannons and you can see their little heads poking out of the end. Fire them into the clouds and watch as they flail through the air before landing with a cartoon splash. In my session, we name our vessel the ‘Third Time Lucky’ due to a couple of unfortunate events that befell us. The first is a botched ambush. We see a ship on the horizon, moored at an island nearby, so we hatch a plan. First, we hand in our treasure at the nearby outpost, then we climb aboard our vessel and raise the anchor before scrambling to turn all our ship’s lanterns off. It is only when we are metres away that we realise we have been seen, but it is too late. We hear the rival crew’s voices break through the positional voice chat, then we all die as one climbs aboard with a powder keg, shoots it, and sinks our ship. The glint from our periscopes must have given us away. Our second encounter with another crew goes largely the same. It is as if our ship is cursed. That is why we name her the Third Time Lucky. After christening our vessel we see that, unbelievably, everything goes to plan. We survive a deadly storm, we manage to thread the needle and steer our ship through a tiny arch in some seabound, forgotten cliff – for no reason other than to see if we could. We find buried treasure. We deliver Cursed Chests to an outpost, despite the chests wrestling control away from us and dulling our senses as if we had glugged down a gallon of grog. And our final fight is one for the history books. We see two ships fighting on the horizon and decide to get involved. Again, we snuff out our lanterns before we make our approach – first at full speed, then, when we get closer, one of the crew pulls down the front sail to give us more manoeuvrability. On approach, one of us (me) occasionally breaks out our best pirate impression and growls, ‘Nobody expects the Third Time Lucky’, until we are right in the heart of the battle. The two enemy ships are side-by-side, I get us in close for a slow pass and we unleash our broadside cannons into the first ship’s hull. We reload, then we do the same for the next ship. The old one-two. Smooth as you like. As I steer us back round, we realise that both ships are sinking, and so we belt, in unison, ‘Nobody expects the Third Time Lucky’. Sea of Thieves feels like a canvas for personal stories – all of them hilarious. Still, it will only prove itself when it voyages into the turbulent seas of community management. Rare may have captured their studio spirit in this wonderful, inventive creation, but other players could scuttle this vision. The proof will be in how the community forms, whether players build up some kind of etiquette, or if it becomes a breeding ground for scallywags. As it is, Sea of Thieves is a game that encourages griefing. Firstly, there is a brig mechanic that allows a ship’s crew to vote someone into a cell below deck. You are also expected to fight, ambush, and steal from other ships. Fortunately, Rare seem to be prepared for trouble, as they give everyone the tools to make encounters with other players much more interesting than straight-up combat. 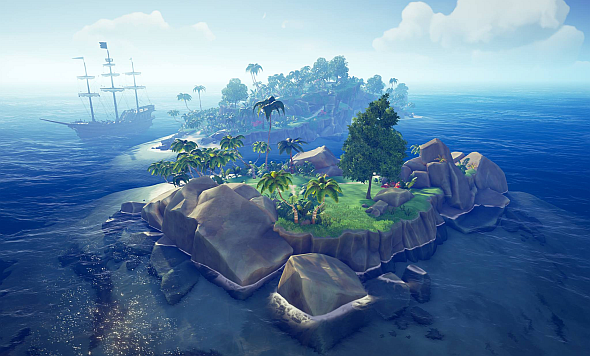 Each island in the game is handcrafted and designed with a purpose in mind, from smuggler’s bays where you can hide your ship from a pursuing enemy, to islands with intricate cave systems where you can lure or escape your foes. Then there is the Kraken, a huge monster with eight tentacles that can be summoned under mysterious conditions. Its tentacles can grab you and slam you on your ship’s deck, dunk you underwater, and tear your ship to pieces. Having eight arms, the beast can also attack multiple galleons at a time. 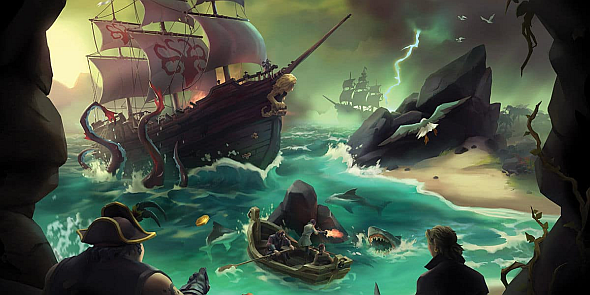 If Sea of Thieves was an MMO, the Kraken would be a raid boss. 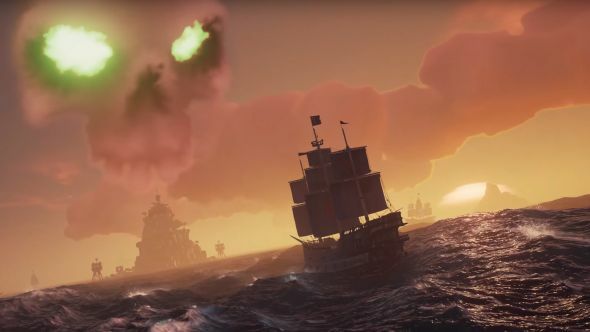 As well as featuring giant sea monsters, Sea of Thieves has its own version of public events: Skeleton Forts. A skull-shaped cloud hangs above these skeleton-occupied bases, pulsating and drawing players together. These are stacked full of skeleton enemies and require crews to work together to clear. Once killed, the skeleton captain drops a physical key to a vault in the centre of these fortifications. The vault contains so much treasure that a single crew will need to take multiple trips to load it all onto their vessel. This alone opens up room for backstabbing, cooperation, paranoia, and, ultimately, unique anecdotes. Why load up your ship when you can just wait for another crew to do the dirty work? The fact that the key is a physical object is the topper, potentially kicking off free-for-alls between rival crews as they fight each other as well as skeletons, all trying to make their way to the vault. Outside of these examples, you can take on the life of a peaceful trader, shipping livestock between outposts. One quest could have you ferrying some pigs across the sea, feeding them bananas to keep them alive for the journey. But what happens when you come under attack from another crew and suddenly you are low on potassium-giving fruit? You are then forced to decide on what is more important: the pigs or your life. Or maybe you have to ship pigs and snakes somewhere. To keep the venomous snakes from biting your pigs, one crewmember must keep those slithering murder ropes calm by playing them a soothing shantie. Everything feeds into something else. Sea of Thieves is a game packed with potential. There are so many ways everything can interact that it could end up being the best anecdote generator out there.